Specs, the Spectacled Owl, with lunch. Sage the Tawny Owl, who will be in a book, but was bashful. I have a date with her in spring when she’ll be more in the mood to fly for me. On Thursday I spent a wonderful (if cold!) day at Icarus Falconry at Holdenby House, Northampton, learning a little about birds of prey (raptors). Thanks to a good friend, I got to feed various birds, fly a couple and put one through its gymnastic exercises for the day. I think the best thing is for me to let the pix speak for themselves. My thanks to Jo for giving up her day and sharing her knowledge, and Mike for letting me visit. 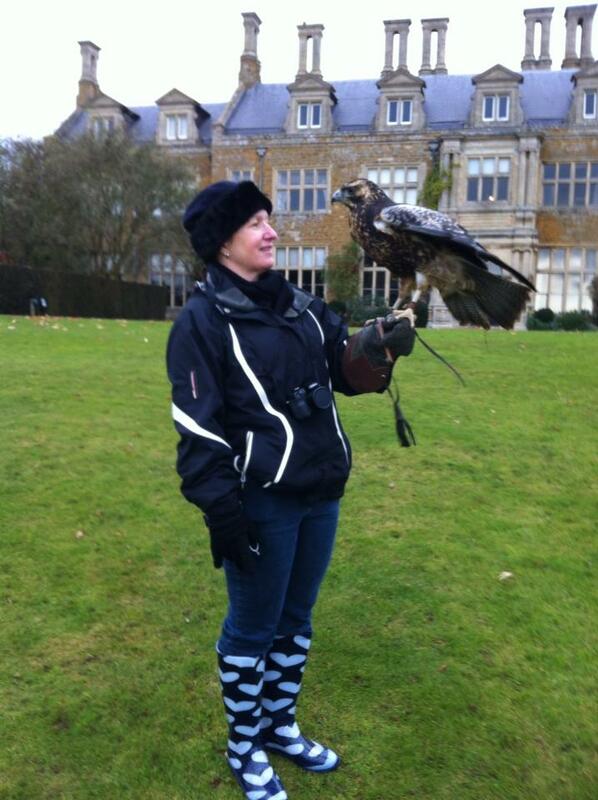 With Horizon the Eagle Buzzard. He was admiring my wellies, I think. With Pitch, the Peregrine Gyr falcon. With Rosco, who flew to my fist with a ‘Whaddya WANT?’ look. He’s about 4.5lbs and yanked my shoulder as he landed, in contrast to Horizon, the Eagle Buzzard. Owls are equipped for silent flight but not weightless landings. 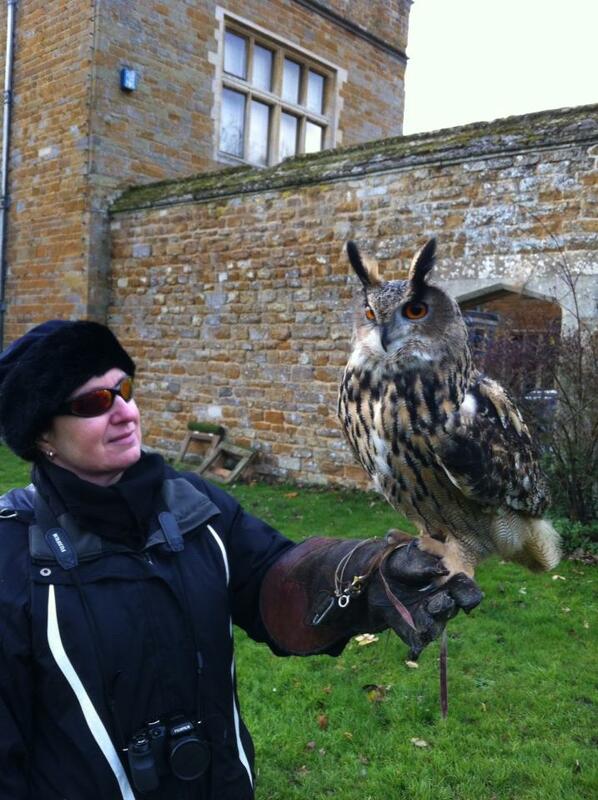 Rosco, the Eagle Owl. Gorgeous, majestic. Golden Eagle. If all the birds were put untethered in one cage, this is the one that would be left. Gordon the Harris Hawk, who has a padded bow perch because he has a bad foot. Get well soon, Gordon. Horizon, the Eagle Buzzard. Less than a year old, a screech to deafen you, lands on your fist as softly as snowfall. 5 JULY 2019, 6-8pm – Meet the authors: Alex Brown, Julie Caplin and Sue Moorcroft at Waterstones, Milton Keynes. More information to follow.